Not everyone wants to spend $40 on Uber from IAH Airport to downtown Houston. Thanks to Bus 102, getting to downtown is cheap and only takes about an hour. 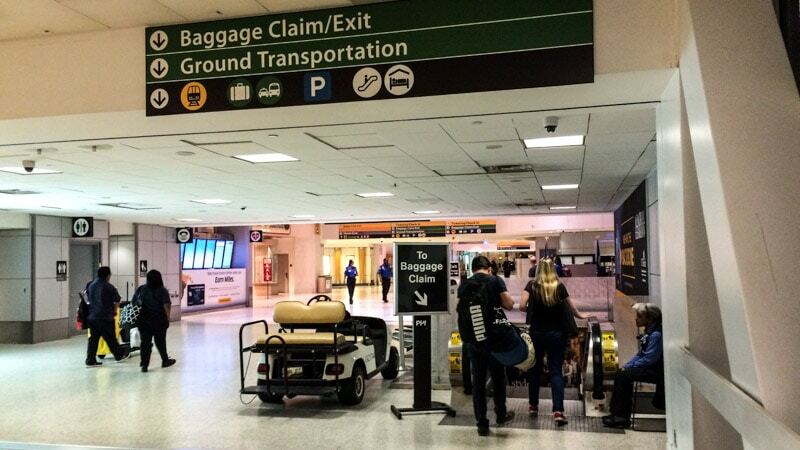 This guide, and Bus 102, begins at Terminal C of George Bush Intercontinental Airport (IAH) north of Houston, Texas. If you find yourself at another terminal, I would assume you can just follow the signs towards Terminal C.
The journey begins inside Terminal C. From your gate, simply follow the signs towards Baggage Claim/Exit and Ground Transportation. Take the escalator down towards Baggage Claim. At the bottom of the escalators, you are now in the baggage claim area. From the end of the escalator, make a U-turn and head towards the doors. Exit the door where it says Shuttles & Buses. This exit is door C-105 Terminal C.
Once you exit, you should see an assortment of shuttles and buses, mostly headed to hotels, car rental agencies, and parking lots in the Houston area. To reach the stop for Bus 102, cross the street in front of you towards the road. Watch out for passing shuttles and cars. When you reach the island between the shuttles and the airport road, make a left and follow the sidewalk down for about 100 yards and you will find the bus stop for Bus 102. Now that you made it to the bus stop, all you have to do is get your fare ready and wait for the bus. The cost for a single journey is $1.25. The bus arrives about every 30 minutes. When you board the bus, you will feed your fare into a machine that accepts bills and coins. No change will be given so make sure you have exact change or at least a couple dollars. Otherwise, the trip will cost you a lot more than you were expecting. After you pay, you won’t receive any ticket or receipt, just take your belongings and find an open seat. I noticed that most of the people using Bus 102 were airport workers and other local residents as space for luggage is limited. There is space above seats for carry-on sized luggage but anything larger and you will have to find another mode of transportation to your destination in Houston. As the bus leaves the airport, it makes multiple stops along the way including hotels in northern Houston and other points of interest. After about 30 minutes of stops near the airport, the bus hops onto 45 south straight towards downtown. It takes about an hour to reach downtown. Keep an eye towards the front of the bus for information about the next stop. When you see your bus stop listed, press the small red button above your seat. After the bus stops, grab your belongings, exit the bus, and welcome to Houston. Just remember that you cannot check your bags at the airport, so you’ll have to drag them with you on the bus, FWIW. Possibly you can check them ahead to your next destination so you don’t have to tote them. You can store larger luggage under the bus storage compartment. Almost three years later, this is still a great post. Especially with the pictures, it helped me A LOT when I landed at IAH yesterday evening. Thanks to you, finding the bus was a breeze, and the bus driver helped me find the stop closest to my hotel. I caught the 6:20pm bus (right on schedule) so most of the traffic seemed to be leaving the city That bus was not very full so no trouble with my carry-on luggage. THANKS! Thank you so much! I’m on the 102 now. I googled a a few articles for assistance and yours for me straight to the bus. Thanks for the photos! I printed this post, because I am one of those people who get lost pretty easy. I helped me to get the 102 bus. Thank you for posting this! Incredibly helpful, and the price is incredibly low! I have a 9hr layover in Houston and I want to explore Downtown. Any recommendations? Houston has a great selection of restaurants. You are sure to find something you will enjoy. With limited time, I would just walk around the downtown area. Excellent guide! Saved me a lot of trouble in finding the bus stop, especially since the Houston Metro provides very limited instructions. Also note that you can pay the fare with a credit card using the Houston Metro’s Q-ticketing app. This is especially useful when you don’t have cash/change for the $1.25 fare. Thank you for the great tip about using the Q-ticketing app. I will have to update this post.